tags: BILL HICKOK...PATHFINDER...PLAINSMAN...PIONEER...reliving America's most colorful days! Bill Hickok, assisted by Calamity Jane, is after a foreign agent and his guerrilla band who are trying to take over some western territory just as the Civil War is coming to a close. Bill Hickok in his early pre-gunslinger years as a freight-line agent protecting a gold shipment from villains out to steal gold and land out west while America is diverted by the Civil War back east. With the help of Calamity Jane and her horse-trader uncle, Hickok battles the bad guys while trying to win the love of his life, Louise, in a formulaic B western adventure with songs. "Young Bill Hickok" freely uses the names of historical figures to tell a formulaic story of adventure in the closing days of the Civil War. Roy Rogers portrays Wild Bill, earning his name after he wards off a band of Morrell's Overland Raiders singlehandedly. The central story involves the shipment of gold to help finance the Union's war effort, while foreign agent Nicholas Tower (John Miljan) attempts to disrupt the enterprise, enlisting the aid of seedy John Morrell (Wally Wales as Hal Taliaferro). On the side of the good guys are crusty Gabby Whitaker (George "Gabby" Hayes) and Calamity Jane Canary (Sally Payne). Jacqueline Wells provides the love interest for Hickok, and her presence sets up some tension in the film, first as a Southern lady and Confederate sympathizer, and also as Hickok's bride to be who must take a back seat to his duty to help the Union cause. Before the film is over, the Civil War has ended with Lee's surrender, and the news of Lincoln's assassination arrives. Tower's association with John Wilkes Booth was established midway through the film as Hickok discovers a letter signed by Booth in Tower's office. The inclusion of these historical snippets adds some interest to the proceedings, but ultimately have no affect on the main story itself. 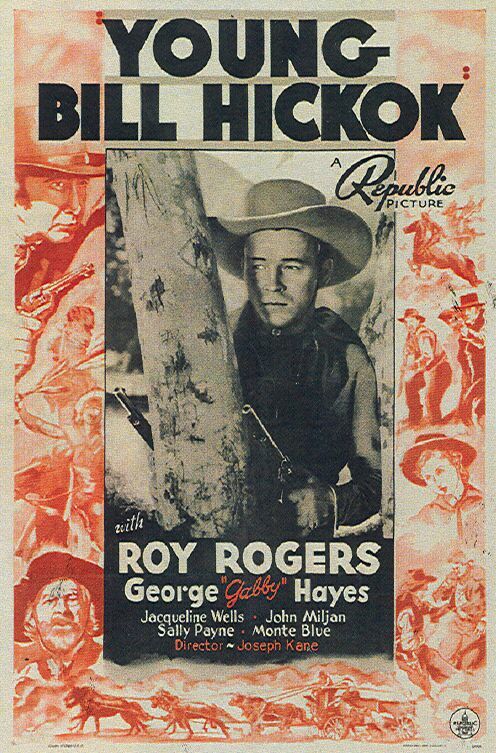 Generally Roy Rogers portrayed himself or a character named Roy Rogers in his films, but as in this movie, he occasionally was cast as a legendary Westerner. For more of this type of fare, try "Billy the Kid Returns", "Young Buffalo Bill", or "Jesse James at Bay". Hollywood had a huge love affair with westerns up until about 1960. Most of the ways they portrayed the west were complete nonsense and they had a habit of injecting real-life characters into situations that never occurred. Heck, the lives of Billy the Kid, Jesse James, Wyatt Earp and Bill Hickok are completely unrecognizable in the hundreds and hundreds of films in which they appear. "Young Bill Hickok" is yet another one of these entirely fictitious films from this era and it even throws in Calamity Jane (a rather unattractive woman in real life) to boot. Playing so fast and loose with the truth drives history teachers like me crazy, but my love of a fun B-movie kept me watching. Roy Rogers plays Bill Hickok and he looked even less like Bill than Gabby Hays who is on hand (as usual) to play Roy's loyal sidekick. As for the plot, it's all a lot of nonsense about Bill tracking down some Confederate raiders and their unknown leader as well as Bill wanting to marry a Southern lady. I won't bother going into any more details as none of it seemed to bear any semblance to Hickok's life. Overall, the film is a pretty ordinary Roy Rogers film. There's lots of singing for no apparent reason, Hays is quite funny in support and in the end good triumphs over evil. The only moment of the film that really caught my attention was the jail break--that was very clever and you just need to see it. Worth seeing for Rogers fans--otherwise just another one of 23281235413 B-series westerns.